Angel Number 333, What Does It Mean and Why Are You Seeing It? The Angel Number 333 – What's the Meaning of 333? Seeing the angel number 333 is a powerful sign and message from Spirit. To understand the meaning of 333, let's first look at the number 3! The number 3 in numerology carries the energy of creativity, joy, imagination, kindness, psychic ability (connection to the third eye), inspiration, creation, growth, and manifestation. 3 is the number of the Trinity and reminds of the oneness and link between Mind, Body, Spirit. It's also representative of Father, Mother, Child… Father, Son, and Holy Spirit… As well as the Triple Goddess. However you interpret the Trinity… This association is a clear indication of how 3 is aligned with the energy of the Divine. In the tarot, the third card is The Empress. The Empress in the Tarot is an abundant, sensual woman who represents the Divine Feminine, fertility, nurturing, Mother Earth, and prosperity. In a reading, the Empress brings abundance, blessings and fertility. In the Zodiac, the third house is ruled by Mercury and the Sign of Gemini. It is associated with the mind and intellect as well as communication, mobility, and cleverness. Combining two Master Numbers, 11+22=33, 33 is said to be the most influential of the Master Numbers and is representative of true compassion, joy, and of a highly influential spiritual teacher. Let's look at what it means when you keep seeing 333! 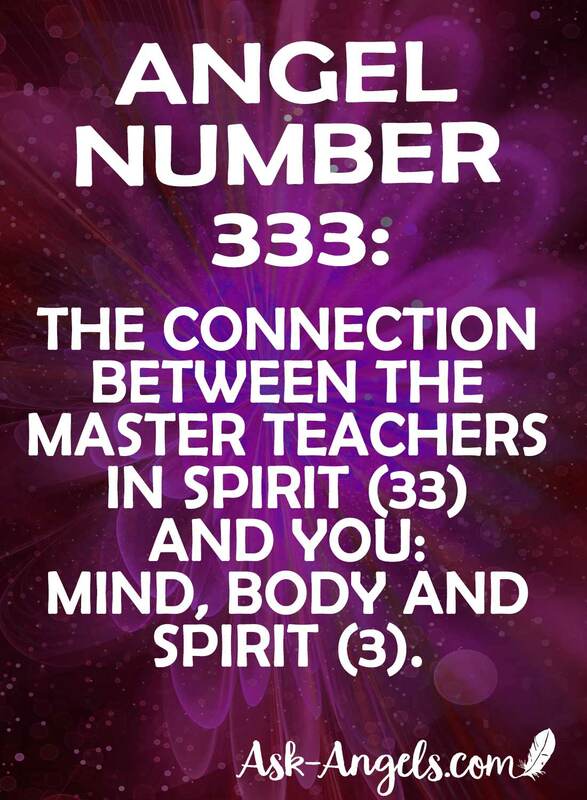 333 is the connection between the Master Teachers in Spirit (Ascended Masters) and you: mind, body and spirit. 333 has a profound connection to Christ Consciousness and the merging of the Christ Consciousness Codes with you in the present moment. 333 is a signal that the Ascended Masters and Angels are present with you in the moment to guide and assist you in your life and ascension journey. Seeing 333 is a clear sign of the Masters responding to your prayers and requests for help… It's a sign they are with you, present and willing to serve you on your path and help out with your present situation. Remember that Ascended Masters are highly evolved and will rarely interfere in your life without permission, because they honor your ability to choose, and they honor your free will … They are however happy to help all who call upon them. With this in mind… 333 is a reminder that you have angels and ascended masters ready to help and assist you… Ask for help! As an angel number, 333 is also a reminder that the Divine, the angels, and the ascended masters are working with you on a number of levels… At the level of your mind, body, and spirit. It's a reminder of the Divine nature of time and a signal that the entire universe is conspiring with you to accomplish your dreams and desires. So get clear about what you want, ask for help and take action to manifest your dreams and co-create a beautiful life experience. 333 is also a sign of your spiritual gifts and psychic abilities awakening and developing in your life. You have the gift of insight, intuition, and a natural ability to perceive beyond the physical realm. Your gifts as a spiritual being and lightworker are needed to assist humanity, and to assist earth. If 333 is a number you keep seeing, it means you have the gift of insight, intuition, creativity and that you have a natural ability to perceive beyond the physical realm. Your gifts as a spiritual being and lightworker are needed to assist humanity, and to assist earth. 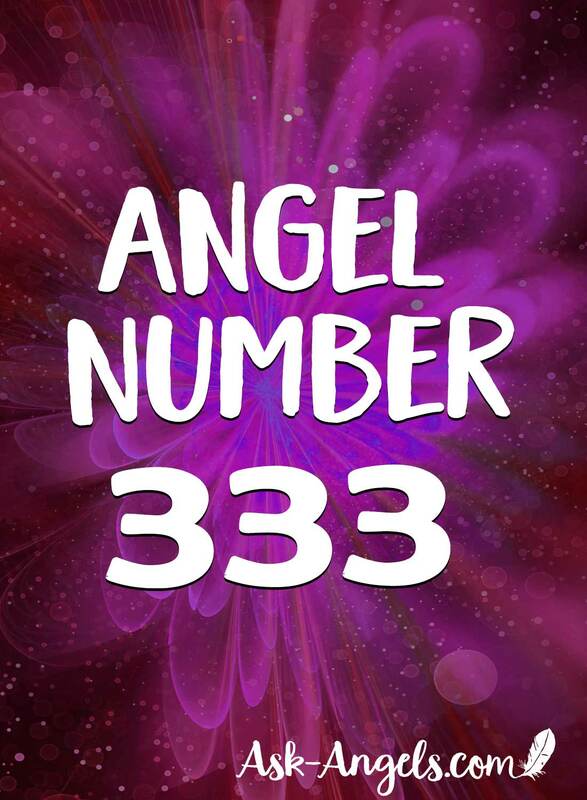 The angel number 333 may also signify it's time for you to take a stand make a choice, and shift out of indecision into action, especially in terms of awakening your Divine creativity, and stepping into alignment with your Divine gifts, and inspiration. Take seeing 333 as an opportunity to recommit to embodying the full light of the Divine spirit you are by remaining in love, staying present and aware, and working with the guides and angels who most certainly are with you. Remember that fully opening to your spiritual gifts and psychic sight is an ever-unfolding process. Keep taking steps to clear your energy, elevate your vibration and remove the layers of filtration blocking your receptivity so that you can fully align with the angels and ascended masters who are ready and willing to assist you. What Should You Do When You See 3:33? When you see the number 333… Whether its on the clock, or anywhere else… Take a moment to pause, breathe and tune in. Take a moment to step back in perspective, observe your mind and your present situation, and open your heart. When you see 333 it is highly likely that you have Angels and or Ascended Masters with you and reaching out with wisdom and guidance. When you step back in perspective to become quiet and aware, you just may feel, hear, see, or simply know the message, and truth that they are with you, guiding you and assisting you. Continually seeing 3:33 can also be a confirmation that you're in alignment with Divine Time, and synchronicity… You're in the flow, and in alignment (or soon to be in alignment) with the path that will bring you joy, love and fulfillment in your life. 333 is also a reminder that higher spiritual knowledge, ascension energy, light codes, and incredible Divine Frequency are available to you. Whatever the specifics the meaning 333 may have for you in the moment… It is certainly a sort of wake-up call and a reminder of your higher divine nature, and ability to connect with Spirit. Just waiting for you to tune in through positivity, openness… And through consciously quieting lower voice of the ego mind to raise your vibration, expand your consciousness… And step into the unknown to connect with the higher love, guidance and magic of Spirit. Again… It's up to you to quiet your mind, breathe, relax, and tune in to the exact and specific meaning 333 has for you in the moment you see it. Listen to your inner voice and intuition to discover the layers of meaning and guidance for you direct from Spirit when you see 333 or any angel number. So Wait … What are Angel Numbers? Angel Numbers are a common sign from the angelic realm. Essentially the angel numbers 333 is a short sequence of numbers that you may see repetitively, or simply noticed at a synchronistic and auspicious time. Do you frequently see certain number sequences? Or do you tend to notice a certain number keeps popping into your awareness from a variety of sources? Maybe you keep waking up at a certain time, repetitively seeing a particular number on license plates, billboards, and then you purchase something and get change in that exact amount! Or perhaps somehow, you just keep looking at the clock right when it strikes 3:33 (or 111, 123, 555, 456, or any other reoccurring combination)? If you have had any of these experiences, you're not alone! Seeing number sequences is becoming increasingly prevalent, and often the angels are to thank. How Can You Learn What The Angel Numbers You See Mean? Think for a moment in terms of energy, and how everything in the world carries a specific vibration and has a unique energy pattern. 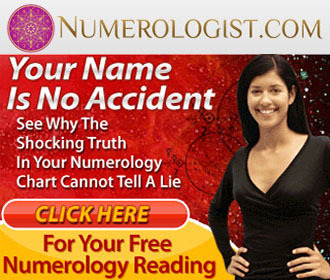 If you've ever heard of numerology, it's easy to understand that numbers too carry a particular energetic frequency. It's by decoding this energetic pattern that the meaning behind the angel numbers begins to appear. When you do notice a recurring number, take it as a signal from your angels, and pay attention! Breathe, quiet your mind, and listen. Be aware of what was happening right before you saw the number, what you were thinking, who was around, and then just be present to see if you intuitively receive more. When you see angel numbers it's highly likely there is additional insight flowing your way from beyond the physical, and with awareness and presence, you're one step closer to tuning into it. PS. Do you see 333 or other angel numbers? Was this post helpful? Leave me a comment below & let me know! P.P.S. I'm going to be writing more about specific angel numbers, but there are lots to choose from! Take the direct path and learn what the specific numbers in your life mean, with a Free Personalized Numerology Reading By Clicking Here! But find out for yourself… Because it’s free! I’m reading above and when you mentioned seeing 333 on a clock, I looked at mine and it was 3:33. Wow. This is amazing. This morning I was playing Words with Friends and my score was 333. I thought, I’ve gotta check in with Melanie and see what that means. But did take a moment to welcome guides etc. and open my heart. When I saw your email later, I was blown away. Weeping tears of joy knowing the angels are with me! Three days before my 18 years dog passed away. I loved him so much like my child and I pray that the accended masters take care of him and love him. I keep seeing 333 and I pray with all my heart that I will see him again. Amen…. It is kind of humorous but to my disappointment I’ve looked at the clock only to see 334, 112, …lol you get the idea. My question is, that regarding a near miss, does it have a meaning? The last several days, it seems that I have been off by a small degree of time. Any ideas from you Melanie? The angels have helped me through my pain and suffering .i could not have not done this on my own.thank you angels. Ironically enough, i was born Gilberto Sanchez III, on the 21st of the 3rd month (March), and also as the third sibling in a family of 6 including both my parents. I never gave it any importance, even when my birthday appeared 6 times on my official California driver’s license. But recently, i was given 6 dollar coins and 3 of them were of the color gold and the other 3 were silver. Much more recently i had to get a smog test passed, and it wasn’t done until i came to the 3rd shop. A day before that however, i had set up an appointment at the DMV but the next available date was October 3. I’m beyond wonder at this point, rather in awe. I’ve had a feeling something was looking over me but now I know there is. I love it. There’s no fear in my life or negative energy, and it feels super great! Angels, I love you!! One night I wake up and the clock says 2:22, then the next night I wake up and the clock says 3:33. What meaning does this have one day after another? Ive always had dreams about peoples name …sometimes messages written and once i wake up..i only remember few words the whole paragraph i couldn’t remember, i dream about peoples faces iv never met, people i know and feeling that i need to give them a comforting message..those dreams stopped about 3 months ago coz lately Ive been under a lot of stress physically and emotionally i never had a quiet me time .. Just recently i dreamed about a person calling me with with these numbers 333 333.. i believe in supernaturals, spiritual beings..so i looked up what this number meant and Im not surprised..because i know iv gone way to far that ive lost all guidance and wonderful dreams i used to have..thanks so much for sharing this information..i know im not alone. i know theres help waiting ..all i need to do is ask..surround myself with good energies. i believe its time. im so lucky and thankful that I come from a long lineage of visionary people. and i truly believe that dreams are a way of communication from the beyond. it could be good or bad .they are there to guide and warn us. I see 33 and 333 alot that’s what led me to this site!!!! !I love this answer to my question of why I continuously see 3’s!!!! I see 3’s and 628 actually all the time!!!! Yes it was useful and thank you for sharing such an information. I was looking for someone to till me what I can do whenever I see theses numbers. I see 333 EVERYWHERE! The last month it has been a lot!! I googled it to see what it even meant. This is great! I just decided to look into this yesterday. For years I have had problems sleeping,waking up at all different hours the one one that always stood out was 3:33 am . I would tell my wife ,people would call my name to get up ,I hear people talking,footsteps and doors closing . I get up all the time to check around the house and nothing,so yesterday I just happened to Google it and and no idea about this. I am a believer and am not sure what to do . I’m sure my friends would think I’m going crazy ! I see 333 (or 3:33 on clock) quite frequently, especially since starting proper meditation with a quartz crystal stone a few weeks back. Hello Melanie, I have been waking up every night at exactly 3:33. I was actually starting to get really freaked out by this, ( thinking this was a bad thing ) when i did wake up in the night I would stop looking at the clock because I knew what time it was. If not waking up at this time I see it all the time. Reading this definitely sets my mind at ease and will help me in the future on seeing the number 333 all the time, with that said I do see the number 666 and that scares me ? Any insight why I see both of these ? Hi mel, my family often sees the #647, it constantly seems to show itself, my daighter was even born at 647, I also have seen 222, 333, 911on occasion. The 647 is the disturbing, hope u find this intriguing. Thankyou Malanie. After my 3.33am experiece I am now a believer in the creator and that we all as individuals are God ! The freakiest of things are happening all the time to me. I have started ready the Bible and I clearly understand it, way beyond anyone else or history tells us. I seem to know it all ?? but it is very informitive and explains every thing I am going through. I am connecting all the dots from third eye Buddhism to Egyptian hieroglyphics. The unfortunate thing is I am 56 now and have achieved all my goals so using the information I have at my desposal is going to waste, I dont need much help if you know what I mean, I’m not even working…..maybe I should start again ? lol. The other thing is I was hoping all that energy that was surging through my head that night would help my language skills and spelling but no, not yet anyway. I haven’t actually ask for help in that department , I better get cracking, silly me ! I see this and other numbers (444,555, 1111) often Melanie, the question is HOW do I “Leverage their assistance”? thanks, youre a treasure! Goodmrning Melanie.For past months now im struggling through a roughed times in my life.I’m a single Mom. No job at the moment. Civil war still going here in Yemen. Our life turns upside down and God knows how we are surviving. To cut it shorts..As today..I want to clean my phone system to work it fast. I was stunned to see 333 Mb total has been cleaned up on my phone. And right away I looked what is the meaning of 333. While I’m reading all the content information It felt so much impact to what it reveals.I cried silently and paused myself to pray and ask and thanking the Divine and felt all the goosebumps all over my body and I felt the Spirit Guidance are with me. Listening to me. To be honest since I was a little I always felt the Divine presence through my life. My intuition and my psychic thinking never get wrong in some ways. And this how I’m so connected and believed that its all from God’s gift given to me. And I’m so greatful for that. I have all my faith to Jesus and to God almighty that he always hear all my prayers. And I live my life fully on that faith. I’m not giving up. Amen. Also i forgot we do a truck check every week . Theres a form to fill out regarding how many ks are owning a few months ago she wrote 333 on her form ! That blew me away !! My phone alarm went off at 3:33 this morning and 3:33 this afternoon. I didn’t set it. But I do kinda remember picking the phone up yesterday afternoon and seeing the screen for the alarm and thinking what is that and it disappeared. Those are the facts. I have been seeing random triple number more frequently now.. sometimes 3 to 4 eg 999;555;1111 times a day.. I’ve always believed there’s more to my energy..natural abilities,, &inner intuition..it’s beyond my control.. 333 has verified this for this morning.. both my sons were born after 3am.. my eldest who is now 27 born @ 3:33am &my youngest will be 23 was born @ 2:57am which is obviously 3minutes to3.. my prayers were answered when I wished for them to be 5yrs apart blonde hair blue eyes 1stchild &2nd brown hair brown eyed. But ive faced many challenges to this day.. & wonder where my next turn leads me.. these numbers I see sometimes confuse my daily obstacles& sometimes makes me wonder that the road blocks are because I’ve been ignoring these silent whispers from our angels.. I am an only child between my parents.. but blessed to have 11siblings between both of them!! I could honestly write a book!! The numbers 333 was on a box when my mother passed away.above her head. So every time we see 333 we pray and think of her. 333 resonates with such light and beauty… A wonderful way to remember her! I’ve left replies for so many people. I hope you don’t mind, Melanie. This is my last comment. I woke up at 3:00 in the morning. Found this site, and got involved. The date? It adds to a 3. I am, of course, paying attention. Right now, I am on the brink of a life-changing decision. This whole experience acts as my go-ahead. Thank you for your knowledge, and for your article. Thanks for commenting Audra! Glad this post on 333 was helpful for you… I love the synchronicity around your finding it! Hello -3 has been with me for most of my life. When I was younger, during pivotal moments, I’d add the time, (like 10:02 or maybe 9:03=12=3) then break it down as I did in that last sequence, and sure enough, it would break into a 3. The number shows up when I need it most. It reminds me that I’m being guided and assisted. Seeing 3 tells me to stay and learn. It tells me I’m in the right place, and to consciously move forward. My birthday adds to 3. It is the number for creativity, and I am a full blown artist of most any medium you can think of. It is my number. When I see 333, I know that I need to be acutely, aware.. I don’t ignore the number 3. This number appears in my life, consistently. I listen. I pay attention. There aren’t many 3s in my life in regards to people. I am surrounded by 5s. It seems that most everyone touching my life is a 5. I often find myself assisting them in some way, which is odd. I was given 333 555 999 666 on a piece of paper by a hood man he came to me but reduce all my strength I wrote those numbers on a piece of paper .What does it mean? Glad to hear Andria, sending love and healing vibes your way! Wow, blown away by article. Just learning about this. Number 3 is all around my life to the point it is getting obvious. Birth date: 3-3-’83, Almost everyday see 3:33am on my clock (waking up, or getting to bed at that exact time). I race lap times in racing games 3:33 very often. And many others situations were the number 3 is involved. It happens so often I started googling. Does anyone have a suggestion on how to deal with this? Your birthday adds to an 8. Look into that, too. 8 is a number of balance. P.S. I meant to mention this in my original post about 333. I recently donated a $50 dollar bill to the food ministries at a rally to protest Trump’s ban on Muslims into this country. The rally was held at a church in Atlanta. My wife and I participated and we were literally blown away at the sheer numbers that turned out. We felt nothing but safe, loved, and a sense of upliftment by and with all of the supporters which included Immigrants and refugees. My wife and I are both veterans, and I am a disabled veteran from the Liberation of Kuwait in 1991. (Weapons Load Specialist in the United States Air Force. Loaded the jets.) Well, my wife and I are passionate in our own ways about the care and evolution of what I call the “Community of Humanity.” So I had brought the $50 and she suggested to donate it. It was $50 I had been given by my neighbor for mowing her lawn over the summer, and it meant a lot to me. So my wife, being the sweetheart she is knew that and surprised me by bringing home a $50 to repay me. Anyone care to guess what the first three numbers were on that $50 dollars, in that sequence of numbers top left, and bottom right? Indeed!!! 333 : – )!!! I just want to say how much I’m enjoying your Angelic messages and all that you share and make available to those of us who are wanting to know about the Angelic Realm, and bringing it into our lives. I was “guided” to focus more on the Angels this year and I am having a truly WONDERFUL time of it. I loved this reading about the number combination, 333. With my focus in tune with the Angelic Realm this year I really ‘get’ this message, and I love it! You see, the number 3 is my life number. I am the third child born into a family of 7, I was born on January 3, 1960, I only weighed 3 pounds when I was born(I was six weeks premature), and I spent 3 weeks in an incubator to gain one pound so I could then go home with my parents, weighing a safe 4 pounds. I was told that every day my parents and Grandparents(Maternal), prayed over me to live, and be healthy and well. …..Well, here I am!!! I have had a very troubling life, but awesome too as I am learning in understanding the natural laws of the universe, creation, worthiness, divinity, the correlation between body, emotions, thoughts, and spirit, etc…and now Angels, and Archetypes! I thank You immensely. I love your story and I thank you for making it known to us. It’s rare and beautiful! I Thank You for allowing me to share this about myself here. Thanks Melanie you’ve been playing a big part in my spiritual growth for a few years now and just want to thank you. I’m doing a spiritual Tapas with Raphael at the moment and at 3.33 my phone battery was 33% so took a step back and look up your advice. I’m so honored to hear I’ve helped you to grow! Thanks for commenting… I love hearing about the little synchronicities angels use to guide people to the site! Just realised that I write my initials TT as PI sign = 3.14, and I was born 3/3. Sign or not? 333 numbers follow me and i woyjd lije to know wht. not into church like others but believe in God just pray alone at home. Very Good hearted individuals. Helping others before themselves. Faith, the date you wrote this? It adds to a 3. Three has been my number since birth. For eternity, really. I feel that God speaks to me through numbers as well. Anyway, yes. I wanted to point that out to you. The date that you left this. It’s a 3. I have been seeing number 48 for some time now I need to understand if one of my Angeles are with me especially the one that was born in 1948. Does this mean maybe all of my departed loved ones are with me.?! Hi, Patricia. 48 is 3. // 4+8 = 3. I have been seeing 333 on and off for a number of years. Here the past few days its been like everyday sometimes 2 or more times a day in various places, clock, phone , internet, stores, signs…just randomly everywhere… it’s like I’m going about my day just doing what I do then BAM all the sudden my attention gets drawn to something with 333 on it and it’s not like I am actively focusing on looking for this number during my day. Rich -Interestingly, the date you left this comes to a nine. 9 is 3+3+3. 444 I just recently saw 444 after my father passed away on 423. His room number was 222. 423 is also a special number ,add it up and you get 9. The divine number of the universe. everywhere I look , every day for over a year I always see those numbers. And as soon as I hear the phone ring I look at the clock just as I’m thinking of my brother, and the clock will say 619 phone says Edward calling which is my brother. This happens about 5 days a week. and we talk just about everyday. I got with a dude on 6/9/12 I mean I guess that’s the date. That’s when I was officially “dating” him I suppose but we had been talking already. Well that’s 333. 6 to 9 is 3 and 9 to 12 is 3. 333. BUT this relationship seemed to be TOTALLY karmic. Maybe even an energy vampire/false twin? He was manipulative, a compulsive liar, addicted to very strange sexual things, he was emotionally abusive. Maybe he was a catalyst? Because long story short, the man who I thought to be my real twin flame came back into my life. Before he was just a friend but then he came back, I was still trying to make it work with the abusive guy (long distance), but I fell for him. He used to be my best friend but it’s like.. Magical with him. I ended up ruining our relationship bc of the baggage I had with the abusive ex to e truthful. So why the 333? I am constantly finding dimes every where I go alot of times they r lined up in a row of three but it never fails every single day and every where I go theirs another dime laying some where just waiting to be picked up so I always pick it up and I say every time THANK YOU ANGELS but just curious as to y the dimes I find it very fascinating I love it but just wondering still y dimes..
Definitely angels… They like to leave money in places for you to find. If you notice other coins, similarly pennies are just as important, and you are just really good at helping them manifest dimes. I see the numbers 1234 almost daily in the clock. Sometimes, I see it come around the clock both times of the day. It had me a bit freaked for awhile, as I couldn’t figure out why I would look at this exact time everyday. Any ideas to this set if numbers? I have been an 11:11 person as long as I can remember (childhood). Lately, I have been waking up 3-4 night a week at precisely 3:33am. I have also been witnessing all number sequences just about everytime I look at my clock.. EXCEPT 11:11??? Thoughts? I would like to know why I keep seeing the Numbers of 333,111,1111 and 44,444. Wow, is just the answer I was looking for, it’s amazing. So glad to hear… Blessings! I was just praying very hard for a poor kitty cat outside my apartment he is crying and litaraly starving I put food and water out but scared him away when I went to turn off my light the poor little feller didnt even get a bite to eat. I am a huge animal lover and this hurts me to my soul so deeply and have been crying and praying very hard for the good lord and the angels to guide this fur baby back to my patio to get food ,water and shelter when I looked up at the clock it said 3:33 and heard the cat cry again so Iam hoping he is being guided back to get a belly full of food and a good nights rest. I see my birthdate, 326 my husbands birthdate 1012 & our anniversary 810 all the time. Is there a specific meaning to this? My Mom said I was born at 3:35 AM on saturday which is also documented on the Birth Certificate, But I feel the actual Time I was born is 3:33 AM as in that point of time (1985) we did not have much of digital watches or clocks. Since 3 to 4 years I have been seeing 333 on most of the places(numberplates , Mobile screen , Billboards, comp screen). I need to know why only some people are chosen . what is the reason and purpose behind this. What is the message those angels want to deliver to me. Please help, any advise regarding this will be appreciated. I’ve been seeing 00:00 a lot. What is the meaning of this?Thx! For a very long time, I have always thought that the meaning of the repetition of the number 3 had a negative effect if anything. When ever I saw the number I would think it was bad so felt a little nervous. (Thanks scary movies) The number 333 apeared frequently in odd situations. And just so you know a little about me, I do a lot of thinking. Primarily about the big picture of life and things that really have true effect on our lives. I have learned that I have figured many things about life and the universe out on my own. When I google searched these things my “theories” are all pretty darn close to the facts online. I know that we are all connected and are all one, I know that time and space are not exactly real, and that our conscience has much more importance in life than we think. It never really crossed my mind to look it up or anything but when I did I was shocked and extremely relived. One situation was when my father accidentally put dog prescribed flee repellant on my cat and went to bed without noticing. Putting that on a cat will poison the cat and cause it to die within hours. In the middle of the night I randomly woke up at 3:33 AM, got a drink and saw my cat. His eyes were all black he was shaking to death and could barely move. Luckily, my parents brought the cat to the vet just in time to save the cat. They said if we didn’t find him in another hour or so and the cat wouldn’t make it. The other experience was when my grandfather was very sick and did not have much time. My whole family was in the room during this and the doctor said that he could hear us and that’s it. He couldn’t talk or open his eyes. We all said our goodbyes to him while he was awake and when I looked at my phone I saw the time and it was 3:33. And without knowing the true meaning of the number I instantly thought “oh no, this is not good” and got very scared. I didn’t know what to think. about 10 minutes after that he passed away. It was very peaceful. Now that I know the meaning of the number I feel safe and can assure that there are in fact those up above giving guidance to us here. for example my address, children’s birth, business address etc..
Hello, trying to understand why the numbers 11 are very relevant in my life??? For example, born 5/6=11 born 11 am have twins born Gemini. 11 letters in my name. My son’s birthdate add up to 11 there names numerically add up to eleven. Etc……. any ideas???? Please, what does it mean when you see number 13 ? I see this number for more then 2 months now, most the time when I’m looking at the clock. I don’t know if this is good or bad number, but so far it’s not really good for me, having hard time now and praying for better to come to me and my family. I will be glad if someone knows about number 13 and let me know the meaning of that number….Thank you. 333 ,33 started appearing to me one day ~2 years ago on a daily basis… to the point where I have felt compelled to take numerous pictures of computer screens,license plates etc.just to document this to myself. my scientific/math background told me that the statistical probability of this happening by chance is virtually zero. thanks so much for providing me with reassurance…. Hi Melanie. My two sons were born 3 years 3weeks and 3 days apart both born on the third of February and November, I was born October 30. I always use the sequence 3330 for my codes I have always felt there was some significance to the number 3 in my like. I’ve been seeing 333 for a few weeks now. I’m grateful for its meaning but today every time I see it, it’s followed by 666. Any insight on that combination? Thank you. I always see 7 and 20, even on my Id card. What those numbers mean?? I see 44 and 444 ALL the time. During the day and at night when I’ll suddenly wake up and look at the clock. There it is 4:44 am. I often see number 666 frm few days..what does it mean ?pls tell. i am very eager to know abt 666. I just wrote a post on the meaning of 666! Hello I see all the numbers you have mentioned plus more of the same as 222,444,555,1212,1111 or 111 but it is the time on the clock that I see these.I always say that it is the Angels talking to me and this just confirms my Angels are with me.It’s not a day goes by that I don’t see at least one or two of these numbers or more times.I love it and Thanks for the Information on numbers and Angels. I think about Archangel Michael alot-several times daily. He just pops into my thoughts randomly, even when I’m thinking of other things, working,etc. I do call on him frequently-pretty much daily, for protection for me, my family, and my home from evil -evil thoughts and acts, evil presences. Whenever I have felt scared like “something” was present, I would call on him and boom! the feeling is gone!! This has been for almost a year now and I have been happy and safe-I rarely have nightmares now! I think I should teach my children this,too. What does this mean? Is he my guardian? Once in a while I have thought of Archangel Uriel, too. I see the numbers 333 and 444 all the time , up to 3 or 4 times a day, at work and at home. Can you explain to me what the angels are trying to tell me. Double 7 (77) feature in my home phone number (along with double 9 and double 0), my mobile number which also contains double 8, my car registration, and lately the number of my new passport. What’s this all about? Lately I’ve been seeing 00:00 a lot. What is the meaning of this. I See The number 28 à lot. What could this mean? The numbers I always see are 523, on the clock and everywhere. What do this numbers mean? So a few typos in that text. I KNOW HE LOVES ME TOO !!! I continually see the number 19, when I first began seeing it I had began to associate it with things are trying to line up. I’ve been listening to my angels for years and know that they look for ways to communicate with us. I had associated this number with a particular person which I am wanting to grow in a relationship with since that was thing that popped in to my head when I would see it. So I took it as a positive sign that when I would see the number 19, the angels are working to line it up. I see it EVERYDAY… Sometimes many times a day. I know that he cares but we seem to be in separate are places which makes it more difficult to comes together. I try to not let it discourage me. I have been asking the question of , what is it spirit wants , and I have asked to see certain #s to show me that. I asked to see 7:19. This is my bday. And sure enough yesterday I got this email about numbers , I read it. , was a little freaked when I realized that he had tried to call me at 3:33, and I some up this morning again at 7:19. I know he lives me too, I hear it every time I see 19. I know I need patience , I hear that too. we need time together angels 🙂 it’s been a long while since I’ve been in love. Him too. A friend had researched the # 19 and told me it was associated with aloneness. That didn’t feel right to me. … So essentially I’m asking for help here. I keep seeing 777. It usually comes when I am checking my funds. 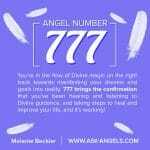 What is it that my angels are telling me around 777 in this case? Will I get another Job? Have been getting 2345 a lot lately, what does that mean? what do the numbers 777 mean as they keep coming up. I constantly see the number 111 and 1111. What does that mean? Recurring 1’s are definitely a message to stay positive and to keep your thoughts aligned with what you want. 555 is a sign of huge changes and a reminder to stay positive… I plan to do an expanded post on this angel number as well! 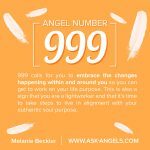 What is my angel number, and what does it mean? Does it mean I have a guardian angel number? I see 222 a lot. …have for over 15 years atleast… what does this mean? I was going through a very intense spiritual/psychic scenario around 7 years ago and I was going through severe psychic attacks. I found a very intense healer who helped with repairing my aura, reiki etc, she said to me that 333 was a bad number for me as that’s when I was getting psychic attacks. I do remember when it happened and my clock would go insane and I would look at the time and it was 333. Thanks for all the hard work you do. And thank you so much for sharing your gift with us.